New-age Jags are not intended to kick the old-school types into touch, but they will increasingly be driving the firm’s fortunes. That’s Steve Kenchington, general manager of Jaguar Land Rover New Zealand. He’s talking about the brand’s second sports utility and the first to hit the sector of that market that is running red-hot. E-Pace, he says, is the right car, aiming at the right segment and appealing to the right customer. That latter comment is most salient. Gone are the days when Jaguar can rely on orthodox cars, in sedan and sports coupe format, to see it right. The XE, XF and XJ and F-Type will remain in the portfolio – potentially, they might yet return the XK, too - but the buy in, not just here but everywhere around the world, is not strong enough now for Jaguar to have any reliance on these models driving it to a target of making one million cars a year. The count it needs to achieve to remain viable in the long term. So now the spotlight falls on sports utilities. Jaguar knew it was taking a gamble when it launched the F-Pace sports utility vehicle two years ago, but it has paid off handsomely. The medium soft-roader has become the marque’s most successful model for decades, selling more than 70,000 copies globally last year, after a similar performance in 2016. Enough Kiwis bought in for it to top the local distributor’s sales chart. It is soon set for revision. Reportedly the next move will be a plug-in hybrid in 2019, around the time of a facelift. Full revision is in the plan for 2022-2023. For now, though, a new assault, with the E-Pace. Then, next year, around March, we will see the i-Pace – entirely different to others in being Jaguar’s first all-electric, but nonetheless also set to be categorised as a SUV. There’s more. Around 2020-21, a bigger soft-roader. J-Pace suggests will be a large luxury wagon on a developed version of Range Rover’s aluminium architecture, but more on-road biased than any Land Rover. Kenchington says he doesn’t know too much about it, but the little amount of information that has been divulged leaves him keen to discover more. In tandem with all these developments, drivetrain changes. Battery-assisted driving is coming; not just in fully-electric format but also as plug-in hybrids, the latter drawing on know-how from the Range Rover and Range Rover Sport hybrids set to launch here soon. By 2020, every new car from Jaguar will have a PHEV option. The charge into the all-electric sphere will not see the i-Pace standing alone at a recharging station near you from next March. Talk is that a version of the XJ (and perhaps J-Pace) will share this Tesla rival’s architecture. Of the 500-plus Jaguar registrations expected within the next financial (April-March) year, at least 250 will be E-Paces, he contends. Hence why a car built made in Graz, Austria, by Magna Steyr on a line running alongside that set up for i-Pace, is here in six long-term nine-speed auto all-wheel-drive editions, starting with a D150 S at 69,900 and going up to the R300 R-Dynamic SE at $89,900. R-Dynamics editions sport a different body style to the mainstream offer. Engine choices are simple: A pair of 2.0-litre turbocharged diesel and petrol four-cylinder choices, each in two states of tune. And, yeah, don’t ask for anything bigger. The brand’s V6 and V8 powertrains are not intended for this size. The line covers three specification levels, with R Dynamic placing between those already mentioned. To whet appetites, the launch period also includes a dozen performance-tuned First Edition cars, with more fruit then the permanent flagship, for $99,900. Too rich? Nah: All but the two retained for now by the brand for promotional purposes have been spoken for. E-Pace enters a crowded sector and while the toughest opponents are cited as the Audi Q3, BMW X1 and X2, and Mercedes Benz GLA, JLRNZ is also aware of the Volvo XC40 and some Japanese fare. Plus a close cousin, the Range Rover Evoque. The F-Pace’s point of difference? It’s the ‘ultimate compact practical sports car’ with an emphasis on the sports, the design brief being to combine SUV practicality with Jaguar performance. Impression from a brief introductory drive, shows that’s particularly true of the petrol model, though the torque-rich diesel, with its sequentially-turbocharged induction system, ensured the First Edition I took from the Auckland airport precinct to Piha Beach was no slouch either. Diesel being a dirty word in Germany has triggered their brands to start steering clear; the and others relinquishing the fuel also cite diminished local interest now that modern petrols have improved efficiency. Kenchington agrees with the efficiency argument but also thinks the D150 S and D180 units could achieve higher percentage uptake than the P250 and P300 alternates, this year at least. “We’re not seeing any drop-off in diesel,” he says, citing Land/Range Rover and F-Pace driver preference for the dark stuff as reflection of how often they tow and drive long distance. The entry E-Pace diesel delivers 110kW and 380Nm and enables a zero to 100kmh time of 10.5 seconds, an average fuel consumption rating of 5.6 litres per 100km and carbon dioxide emissions of 147 grams per kilometre. The D180, with 22kW and 50Nm extra, nails the run to the highway limit in 9.3s, with identical fuel burn and emissions. The petrols, one making 184kW/365Nm and the other 221kW/400Nm, are faster with 7.0s and 6.4s sprint times, but economy and exhaust outputs move up, consecutively to 7.7 litres per 100km and 174 grams and 8.0/181. The base E-Pace configuration is plush, with a six-speaker sound system, automatic wipers, dual-zone climate control, tailgate spoiler, All Surface Progress Control (ASPC), push button start, 10.0-inch Touch Pro infotainment system, autonomous emergency braking, lane keep assist, front and rear parking sensors, 18-inch wheels, daytime running lights, leather interior, power adjustable front seats, puddle lamps, folding side mirrors, auto-dimming rearview mirror, satellite navigation, 360-degree cameras, rear traffic monitor and Wi-Fi hot spotting. The SE nets 19-inch wheels, automatic high beam headlights, powered tailgate, 14-way adjustable front seats, 11-speaker sound system, high-speed emergency braking, adaptive cruise control and blind spot assist, a kick-to-open tailgate, keyless entry and head-up display. R-Dynamic versions have a bodykit, satin chrome highlights around the gloss black front grille and front fog-lights. The interior changes include a different steering wheel, black gearshift paddles and headlining, sports seats, and metal pedals. When it came to styling, it might have been easy for the design team to simply scale down the F-Pace, but instead Ian Callum and his team adopted a different approach. From the outset, this was to be a fun car, one that people would enjoy driving, so they used the F-Type as their muse. Can’t see it? 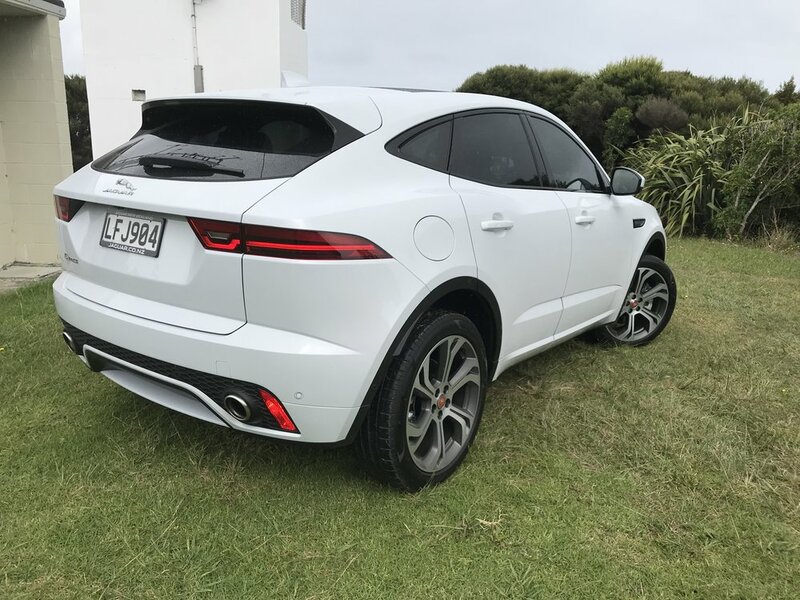 Well, sure, the SUV is by necessity shorter, taller and plumper, but JLRNZ handily had a F-Type on the event for cross-reference and, agreed, there’s a lot of similarity in the details, starting with the lights. Like all current Jaguars, the sizeable rounded grille plays a dominant role in the frontal design. Instruments and controls facing the driver are standard JLR; the electric parking brake took a little finding; FYI it’s a push/pull control to the lower right of the steering column. Quirky. To be fair, it’s not something you need to use frequently – selecting 'Park' will actuate it automatically anyway and a prod of the accelerator pedal in 'Drive' will disengage. This car features Jaguar's latest 10-inch landscape touchscreen infotainment system, which doesn't smudge thanks to its matte finish but isn’t as quick to respond as some rival setups and it lacks the phone mirroring competency that has become so in vogue. Beneath that is a line of small buttons for functions like the heated screens and three large rotary dials for the climate control. Despite the E-Pace being a relatively compact car, with little rear overhang, it still manages to fit in a 577-litre boot, which, with the 60/40 split folding rear seats, can grow to 1234 litres. The cabin is spacious and seems very well finished; everything looks and feels top notch, not least in the First Edition which has some nice extras like a suede-like headlining. Rear-seat accommodation behind the driver’s seat delivers enough knee room for an adult of average height and headroom is no issue for those of average height. There are belts for three, but two adults in the back would be the limit for longer journeys. Deep, tiered door bins allow you to fit plenty in and a deep storage box between the front seats – nicknamed the ‘cubby box’ in deference to this car being the ‘cub’ of the family - offers plenty of space for smaller items along with USB charging ports. To create the chassis, Jaguar delved into other JLR models. The front is a modified version of that found in the Land Rover Discovery Sport. The rear end uses the same design as the F-Pace, only scaled down slightly. Extensive use of boron through the sills and around the car makes it not only 20 percent stiffer than a Discovery Sport but places it as the second stiffest car in the Jaguar range after the F-Type. The trade-off is in weight: There has been plenty of media comment about this model being heavier than the physically larger F-Pace. It doesn’t feel podgy, though. You’ll actively seek some decent roads, because the E-Pace is clearly a sporty car. It’s more than decent grip – expected when you’re running 245-section 20-inch Pirelli P Zeros - well-weighted steering and a sense of it having a nicely-balanced platform; its body stiffness is also immediately felt, too. Large rear anti-roll bars, an increase in negative camber up front and an active driveline all-wheel-drive transmission tuned to deliver a rear bias (though also able to distribute up to 50 per cent of power to the front axle) are factors for positive play. In certain conditions the most advanced drivetrain format can send 100 per cent of torque to the outside wheel when cornering and can adjust this while reading the tractions levels and driver input every ten milliseconds. The P300s have yet to land, so my experience was restricted to the entry petrol, which has very decent verve, and the higher-end diesel, which I liked for its stress-free nature. The transmission slurs through gears to keep the revs to a minimum and exploit the torque, which is available in full below 2000rpm. Yes, there’s some coarseness when it is really pushed, and the stop-start could be better tuned, because the re-ignition phase is quite abrupt and a bit jolty. But, still, I’d take it. Off-roading is within the E-Pace’s remit, so it’s a pity there was no chance to try out the talents of the All Surface Progress Control system that takes charge of the throttle and braking inputs while off-road. Conceivably, once initiated, the driver has to only concentrate on steering and the speed is set by a control on the wheel, just like cruise control. A lateral foray across a small hummock at a park was interesting because the car readily lifted a rear wheel during the traverse; a clear sign of how little compliance there is in the suspension. But then, that stuff is Land Rover’s domain, right?